As a child, I never considered myself an artist. Coloring was an everyday event in our school, especially satisfying for those who owned the big box of Crayolas with the built-in sharpener. My mother found that sixteen crayons were enough. The teachers taught us to outline our space, then color it in. Many of us developed a propensity for needing that wax boundary. How did the educational system know that it was creating artists who would need to outline the pieces of their work? Pablo Picasso recognized the artistic bent in children. “All children are artists. The problem is how to remain an artist once he grows up.” With a desire for outlining, two mediums open up quite naturally for that type of boundary regulated creativity. Quilting and stained glass. Several techniques are utilized onto fabric to mimic leaded edges. Some quilters get a stained glass effect by piecing a thin sashing strip between blocks. Others create the black lined edge by appliqueing fabric on a background. Sew-ers incorporate fusible bias tape on the edges to give the came look of stained glass to pieced fabrics. Any of the stylistic boundaries define the tolerance level of their creator for detailed work. One dramatic application of the stained glass quilting technique is the creation of a Frank Lloyd Wright stained glass quilt. The colors that this architect utilized in his iconic work are bright and geometric. Using these two ideas, plus a lot of black bias tape, a reasonably close copy of one of his famous buildings’ windows could be sewn. 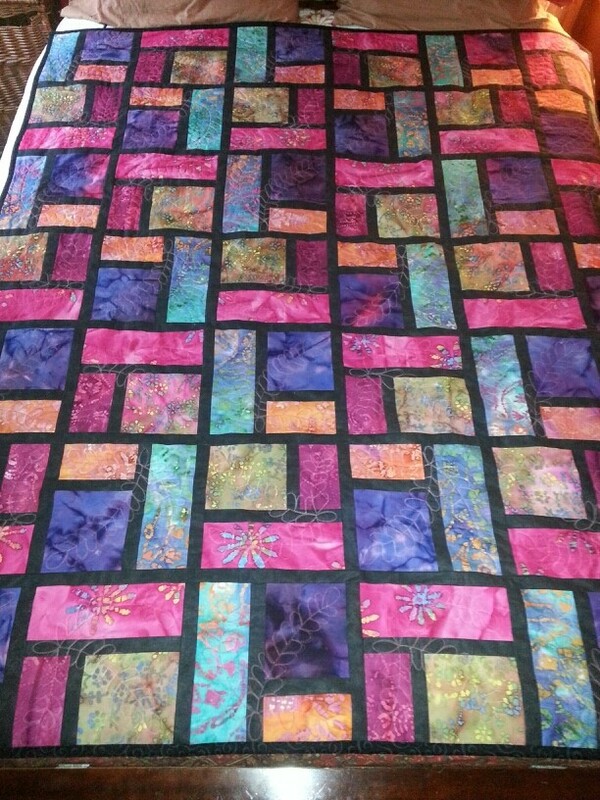 A talented and creative quilter, Betty Bortnickschneider stitched a stained glass quilt as a wedding present for a friend. She created a wall hanging quilt which is 5 feet tall by 3 ½ feet wide for the newly-weds. The design is from an original Frank Lloyd Wright window in the Charles Ennis house in Los Angeles. The simplicity of the concept and the quilting make this a piece that is cuddly and strikingly beautiful at the same time. Stained glass and quilting both rely on providing the eye a place to rest. Frank Lloyd Wright gives words to this technique when he states: “Space is the breath of art.” Betty’s gift to her friend breathes. The title is starting to feel more comfortable. “The desire to create is one of the deepest yearnings of the human soul” according to Elder Uchtdorf. Some of us just like to outline the boundaries of our art with heavy lines. Lines that fit on a stained glass quilt. Now, when I sit in a church or building with stained glass, my view will be different. Not only with the light effects on glass be noted, but my mind will make a leap and envision batiks and solid colors with a needle threading through the caning. Stained glass. Quilts. Allie Aller, Frank Lloyd Wright, Pablo Picasso, Stained glass, stained glass quilts. Bookmark. Thanks for the ping back to my blog. Stained glass art has always fascinated me. You blog post was certainly interesting.